Wow, it’s the end of me-made May already. It really zipped by – probably because I’ve been working so hard! The good thing is my me-made wardrobe saw me through the late nights, somewhat variable weather, and usual cycling round town. 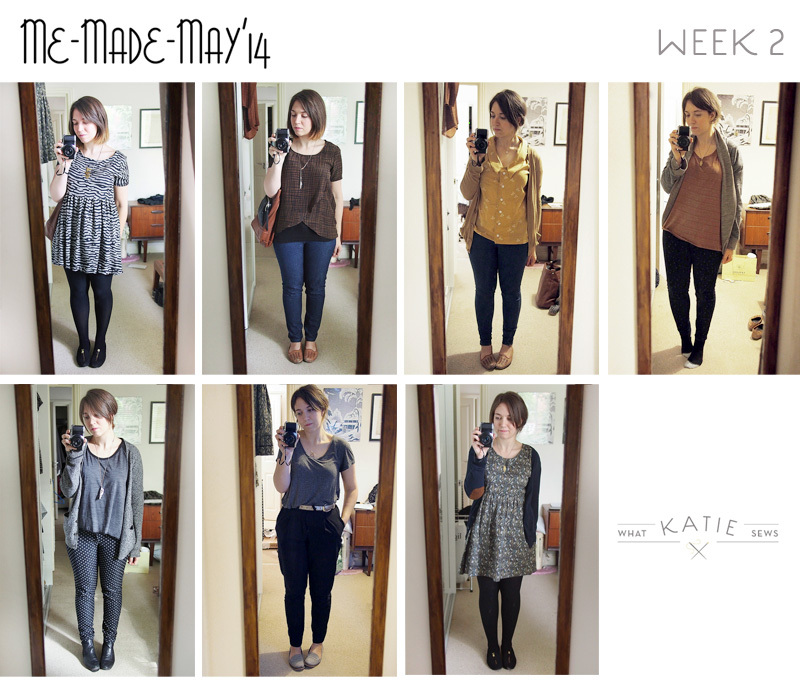 Here are a selection of outfits from the last couple of weeks. 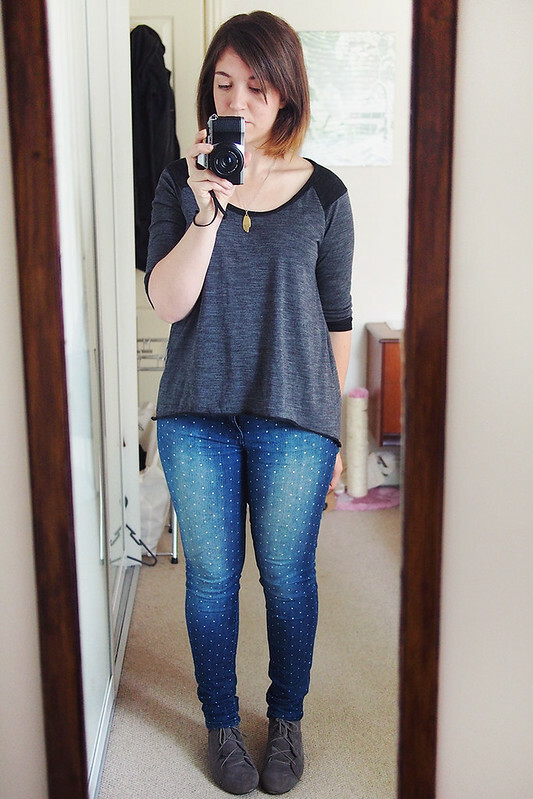 Jeans and tops, jeans and tops. Clockwise from top-left, a BHL Polly, a new Paprika patterns Onyx top, hand-dyed silk noil zippy top and silk zippy top. 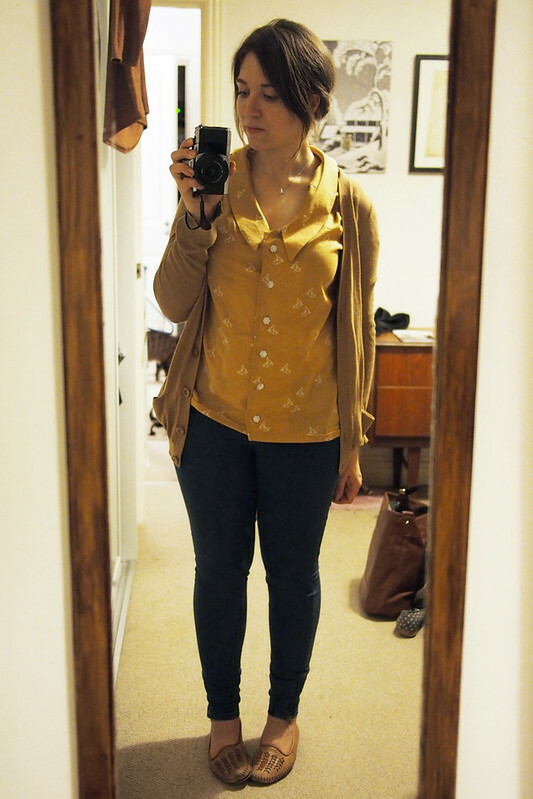 Some with Ginger jeans, some with RTW Uniqlo jeans. 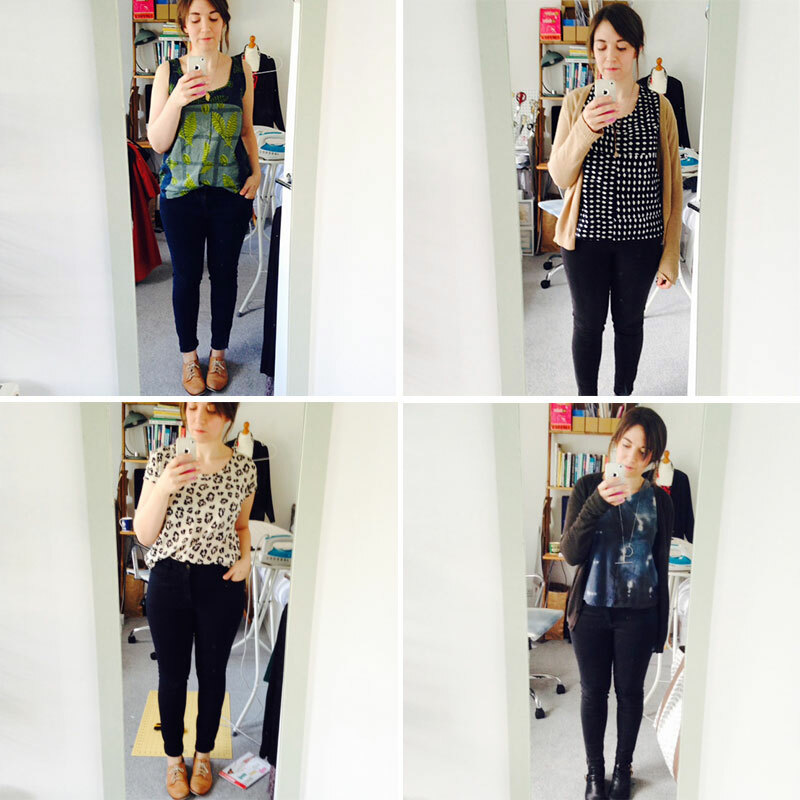 Outings for two pairs of Burda 7017s as a slight variation from the skinny-jeans-and-top silhouette. I actually made a new pair of 7017s during the month, I’ll share them soon. 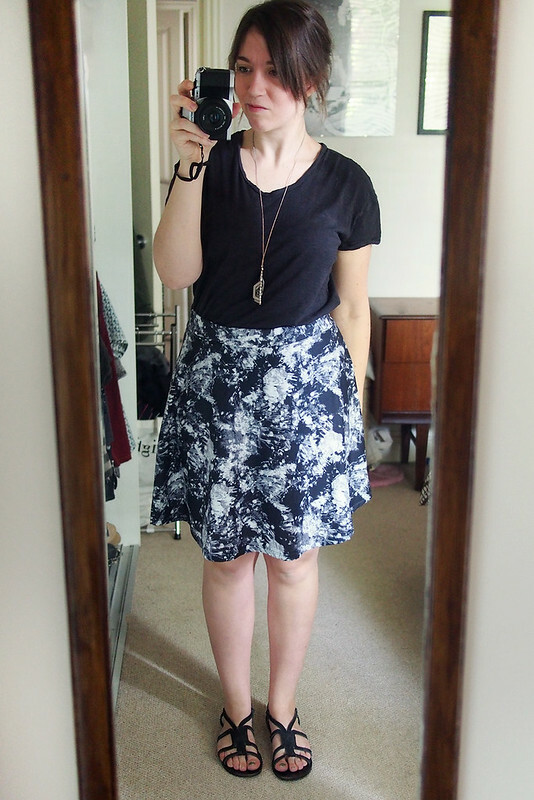 My brand new cloud-print Ilsley skirt has already seen two outings – definite wardrobe winner. 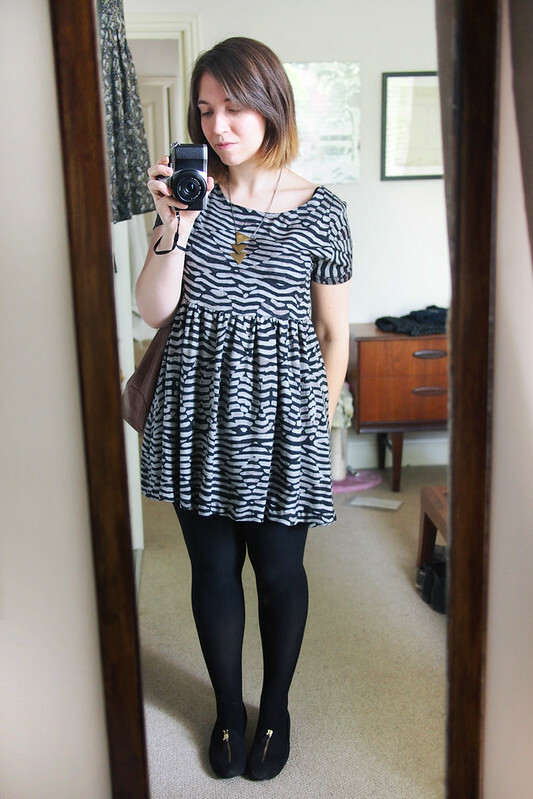 AND this self-draft dress saw two wears in varying degrees of weather – another firm favourite that I need to replicate. 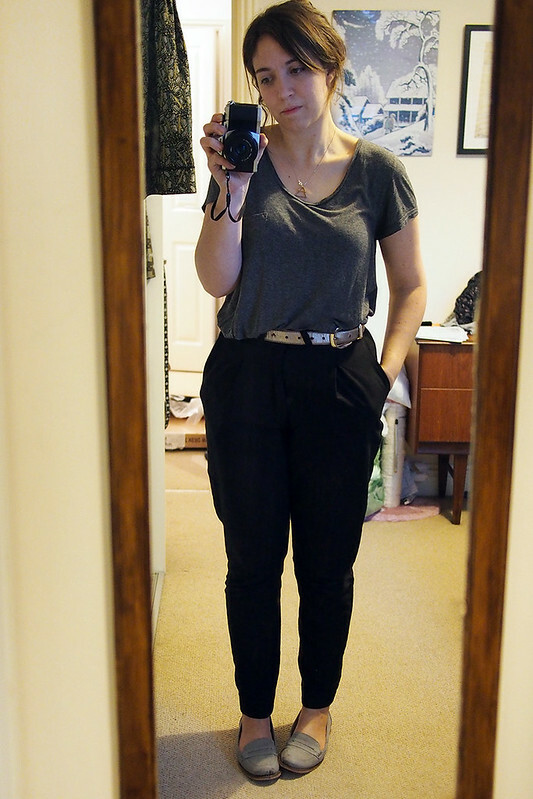 Overall my MMM was definitely a success – I really like where my wardrobe is at now and it’s usually extremely easy to get dressed in the morning. I didn’t even get to wear some of my favourite me-mades before the month was out. 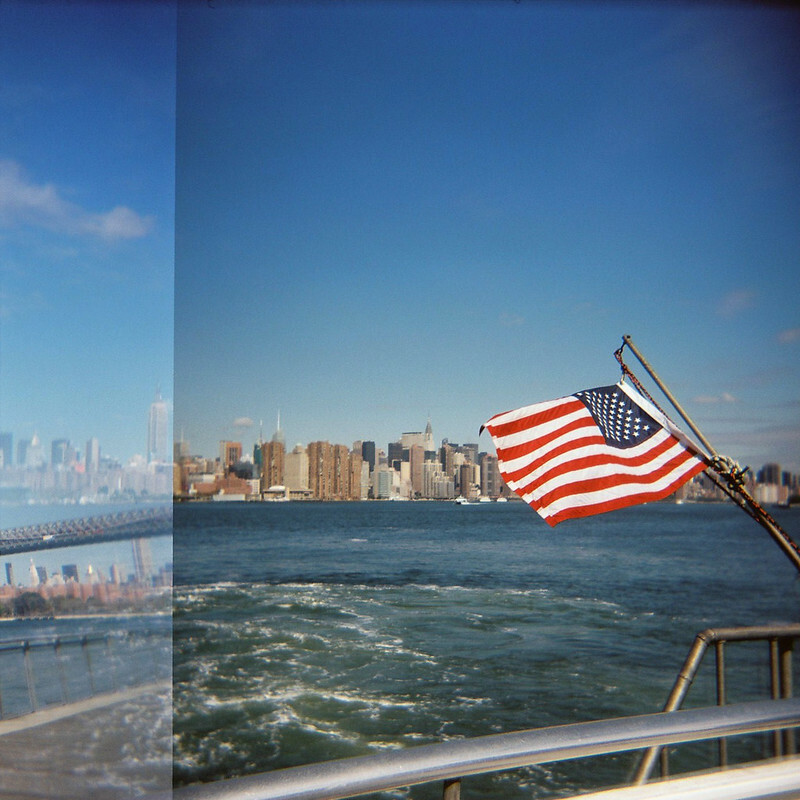 In exciting news, the beginning of June signals that my trip to New York is finally nigh! This was my birthday present from Josh back in January and included a Mood voucher, so more fabric shopping will definitely be happening. I hope to hang out with some NY sewists too! Can’t wait. See you in a week! Comments: Sad sleepyface. 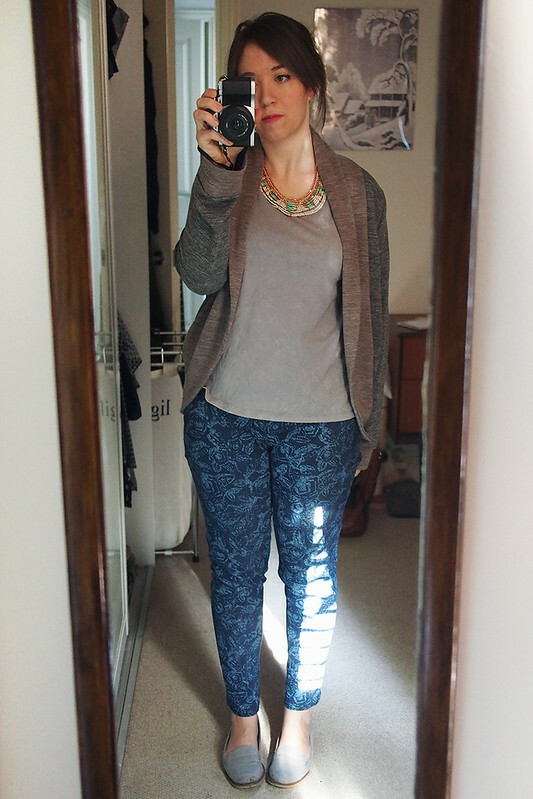 Back to work in the rain with a commute out of town to face first thing definitely called for a faithful cosy top. Comments: If in doubt, wear a Scout! Not much to say about this, easy and comfortable. Comments: I so nearly wore jeans-and-a-tee again so decided to mix it up with a very old jersey skirt. Wearing this reminded me how much I like the Plantain pattern; must make more. It also reminded me that I should wear/make more skirts as it immediately looks like you’ve made more of an effort than jeans. Comments: These are a brand-new make that I squeezed in during the evenings this week – I’m testing out Kelli‘s soon-to-be-released pattern. Spoiler: I love them! Perfect for a much-needed lazy day at home and wander round Stoke Newington. 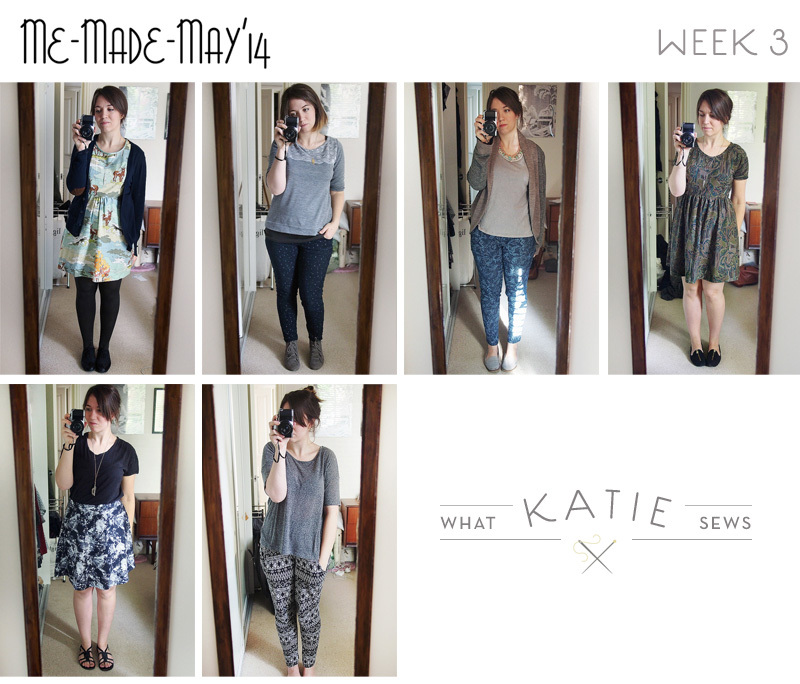 Just for fun, there’s my whole month of outfits! (Less two where I was travelling: I did wear me-mades but I’ll spare the jetlag-face photos.) 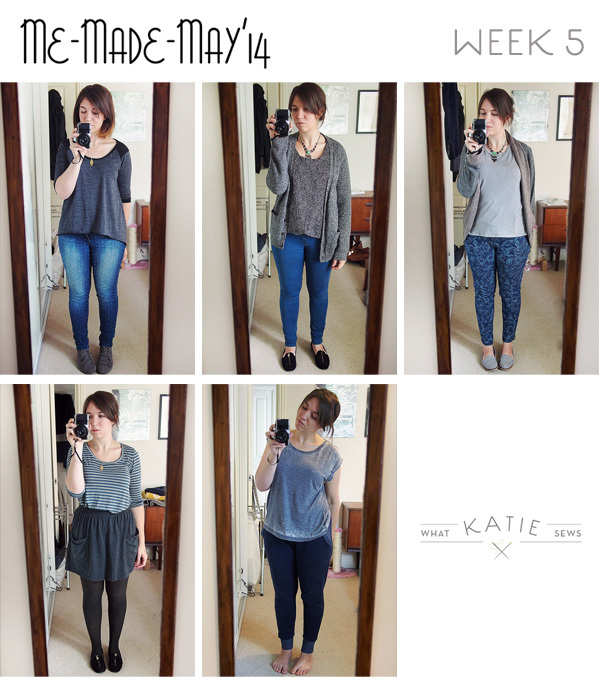 I’m so glad and proud that I completed my pledge to wear at least one me-made every day. 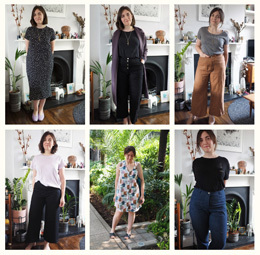 It really demonstrated what I aim for in my sewing: to replace my everyday RTW clothes with high-quality unique handmade versions made to my exact spec. I’m especially pleased at the cohesion I’ve slowly managed to achieve, blending my me-mades with my favourite RTW pieces to make my favourite colour combos and silhouettes. On a whole the month made me confident that I should continue to invest in quality fabrics and construction methods, because those makes are the ones that I feel extra-good wearing. Of course it also identified plenty of gaps that I need to work on: more knit tops, plain non-jean trousers, a casual light coat/jacket and possibly a casual skirt or two are some additions that spring to mind immediately. I’ve amassed a load of lovely fabrics in my stash recently to make these happen: just need some time to sew! Finally I must say thank you for your comments as I went along, they were really encouraging and it’s nice to see that the way I feel I dress is reflected on the outside too. The community aspect of MMM has been really great to follow along with. Vive le sewing! Hola! 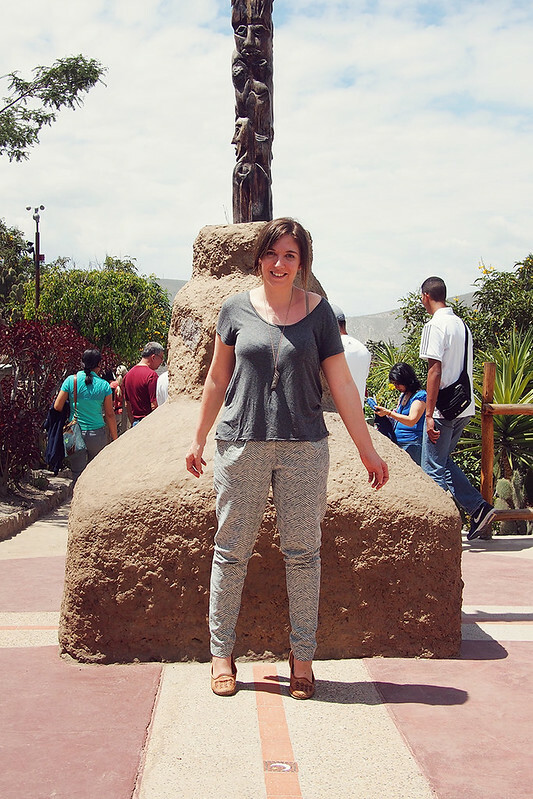 This week’s MMM comes to you from beautiful Quito, Ecuador, where I spent all week on a blogging press trip – in fact, I’m posting this from the airport while waiting for my flight home. Packing for this trip was quite a challenge as I had no idea what the weather would be like at the tail-end of the rainy season. Turned out it was much hotter than I expected, and I did kid of run out of appropriate me-mades – but I stuck with it anyway! 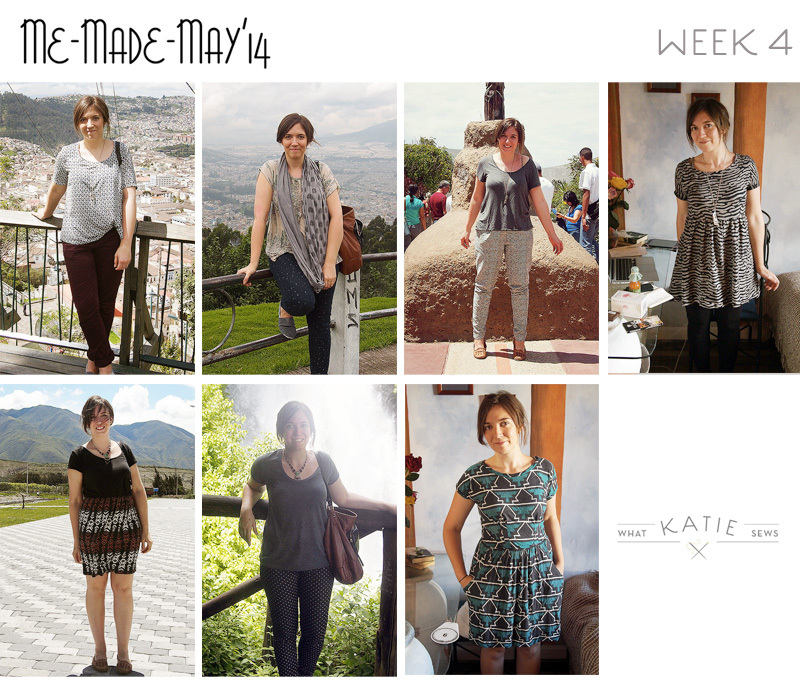 Here’s my jet-set week of outfits… the backdrops this week beat my messy bedroom, eh? 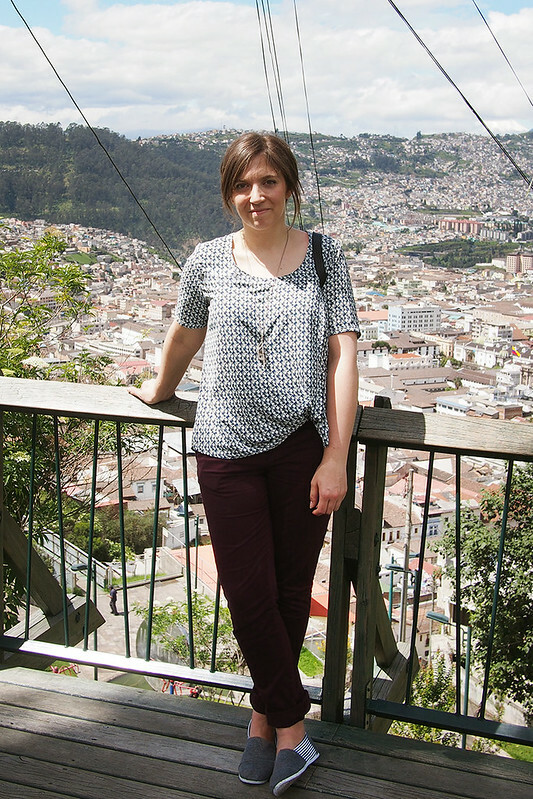 Comments: First day here, exploring Quito’s beautiful old town – it was HOT! 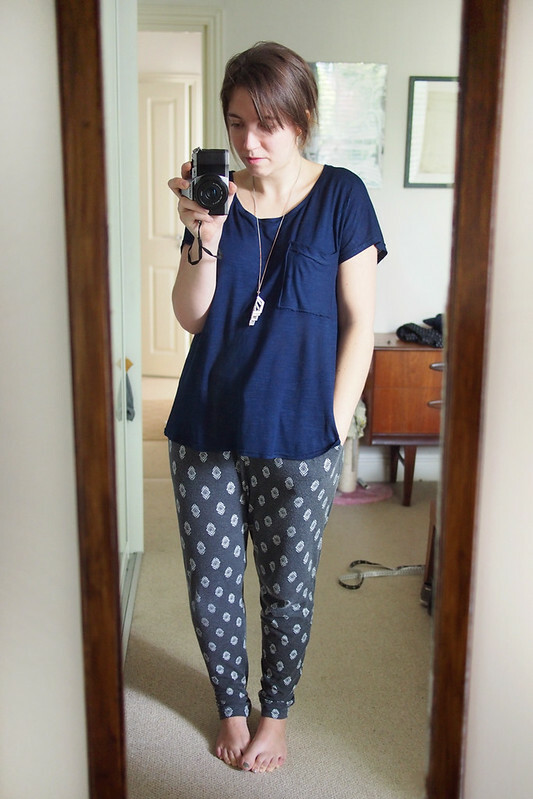 I was too warm in these long pants, but the Elizabeth was nice and cool. The crossover front is tucked in a bit awkwardly here as it was breezy up on this vantage point. 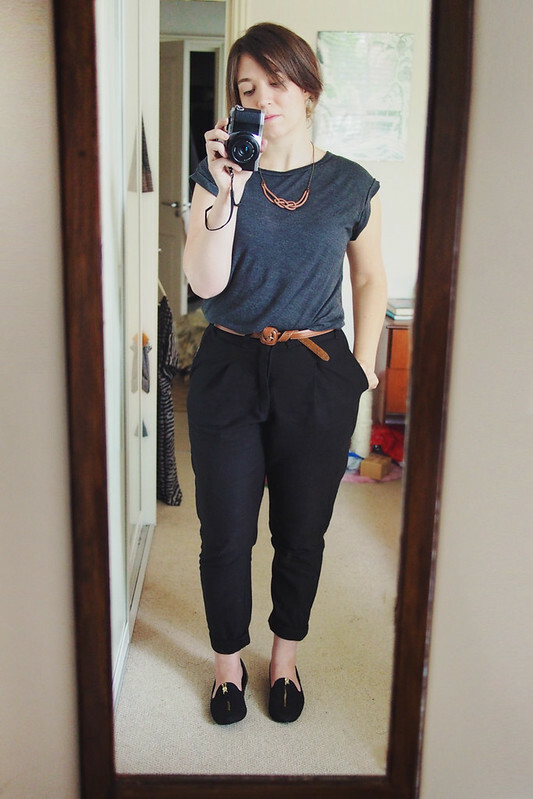 These pants are on my ‘to copy’ list as I wear them tons in spring/summer and looking at this photo I think they’re quite slimming on the hips (no pleats); I’ve bought the Named Alpi Chinos pattern for this purpose. Other: Gap jeans, scarf was a gift. Comments: Sporting some nice sunburn, care of that heat yesterday. It was a bit cooler today, especially as we took a trip to 4,100m above sea level in a cable car, which was as spectacular as it sounds. 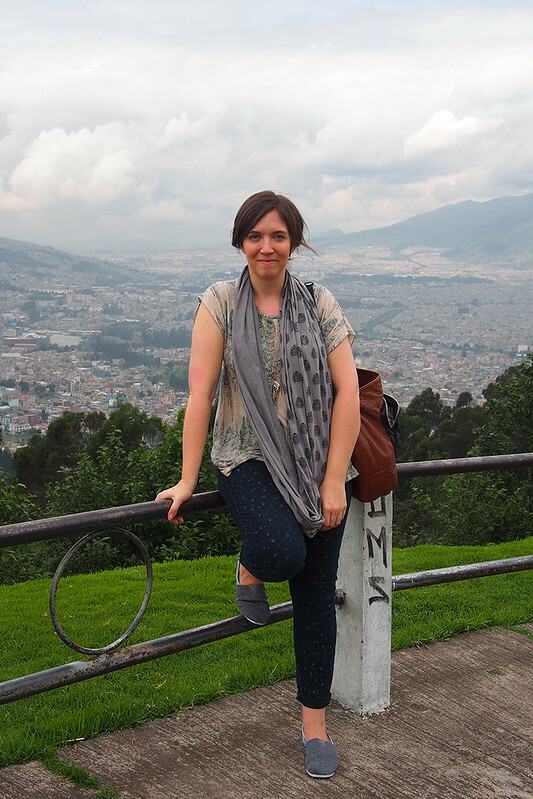 This photo is taken on the Panecillo with views over Quito in the valley behind. You can barely see my top; it’s the same one I’m wearing here. Comments: At the official middle of the earth, with one foot in each hemisphere. My me-mades really are seeing the world! These have gone a bit baggy unfortunately, I might take them in as I love them otherwise. Comments: Had no photographer/guide today so a selfie in my rather nutty trompe l’oeil hotel room. Second outing for this dress; I was too warm in leggings scampering round the new town, but it’s too short without and I felt like wearing it anyway. Check the tan coming along! As you can see by the desk, I bought some edible souvenirs and caught up on blogging today. Comments: Today was an epic train ride between the northern towns of Ibarra and Salinas; stunning scenery along the way and Salinas is as pretty as a film set. 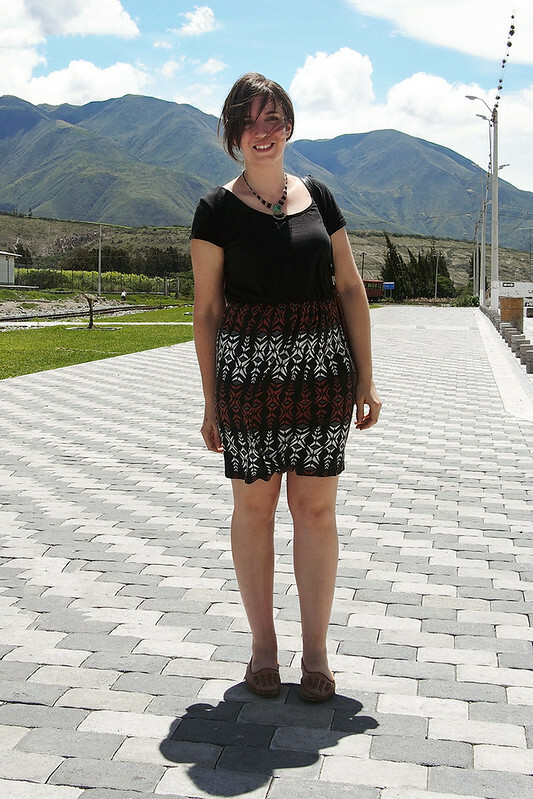 I actually dressed weather-appropriately for once – it was hot hot hot! I bought the lovely necklace from a shop in Salinas where everything in made in the community. 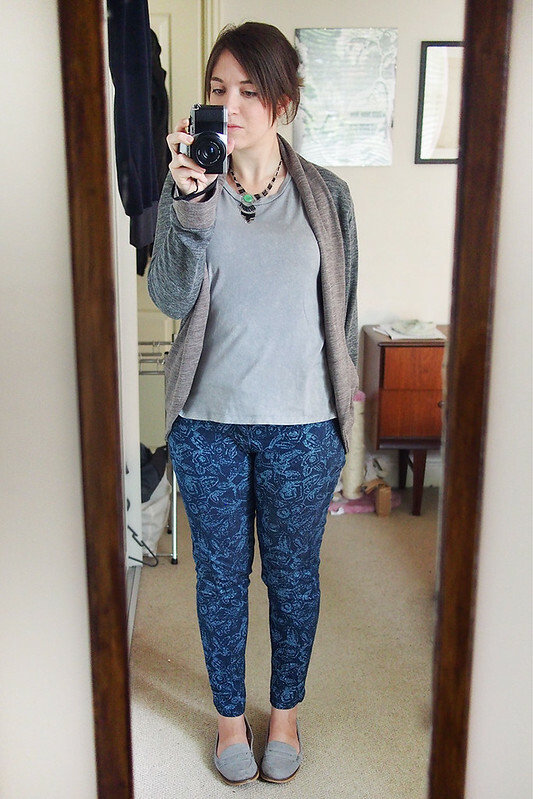 Comments: Run out of warm-weather me-mades in my suitcase and was far too hot in these jeans. 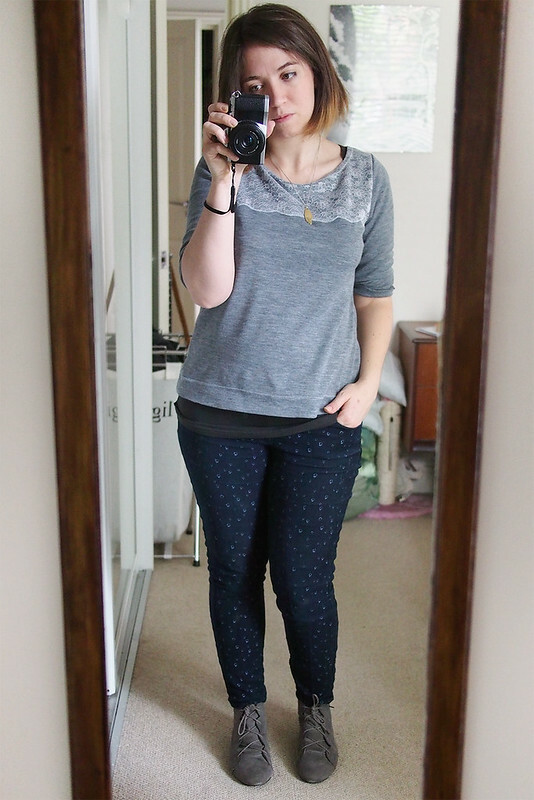 I would have preferred to wear some RTW shorts, but I couldn’t fail the MMM challenge at such a late date. 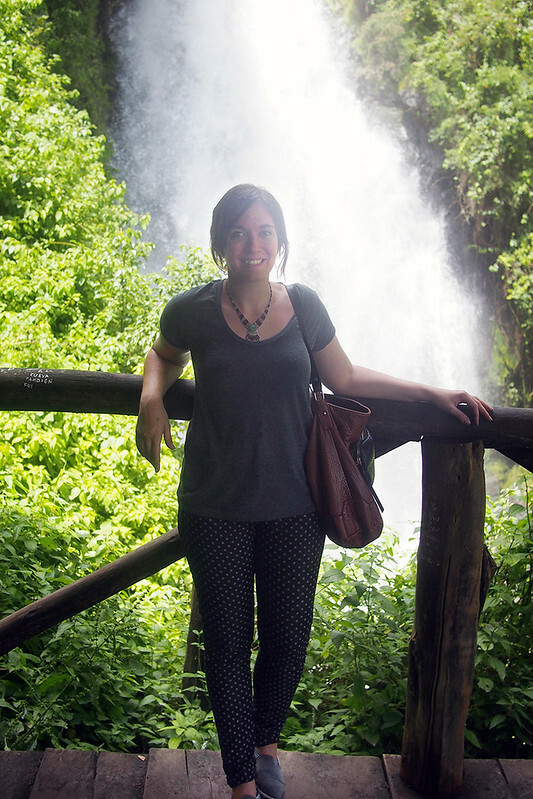 The spray from the beautiful Peguche waterfall behind me cooled me off a bit! We also visited the amazing Otavalo market. Comments: Last morning in Ecuador :( Just time for breakfast and a quick walk in the sun to say goodbye to this beautiful country. 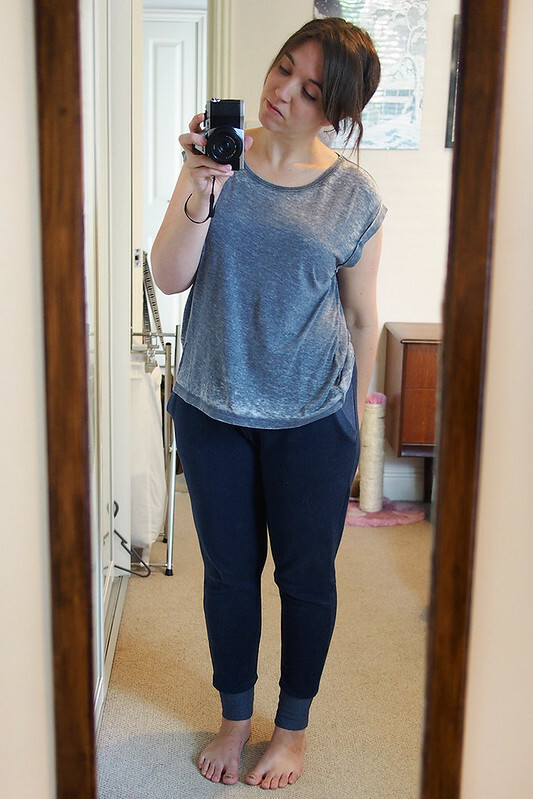 I changed into some sweats and a me-made grey raglan tee for the journey home. Hi! My #MMM roundup is a day early this week as I’m flying to Quito, Ecuador, in the middle of the night tonight (on a press trip for my other blog)! I hope to keep up with #MMM while I’m out there, though I have no idea what the weather will be like – it’s at the end of their rainy season with temperatures hovering at 17-19C, so quite similar to home I’m assuming. I’ve packed everything from shorts to a raincoat, so hope I manage to keep up. This week has been a bit mad with work and evenings out as well as gearing up for my trip, and I feel like it came through a bit in my outfit choices: they don’t seem as cohesive as in previous weeks. I was feeling in need of some breathing space today so cancelled all my plans, even including the epic #NYLon sewing meetup (so you know it’s SERIOUS). I’ve managed to do a bit of sewing as well as packing and tying up some loose ends so it’s been nice despite the feeling of FOMO. Comments: This frock hasn’t seen many outings; it’s really a summer dress but I wore it even though it was bucketing with rain. 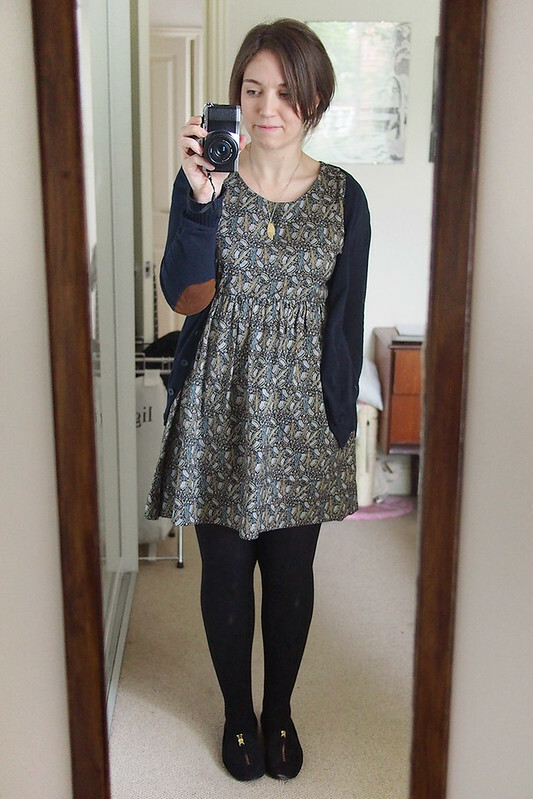 I dressed down the rather outlandish print with a cardi and dark tights. Still I felt like people were looking at me more than usual – especially children when I walked past a primary school! – but that might have been in my head. I felt good in it anyway and hope I can keep it in rotation after MMM. The main reason I wore it is we threw a surprise Spoolettes ‘hen do’ for Roisin, so we were all wearing our Dolly Clackett-inspired finest in her honour. Super fun night, though a bit too much booze for a Monday! Comments: Feeling a bit delicate after last night, so an easy, comfy outfit. Comments: Thank gawd I made a lot of jeans, they’re keeping me afloat in MMM. 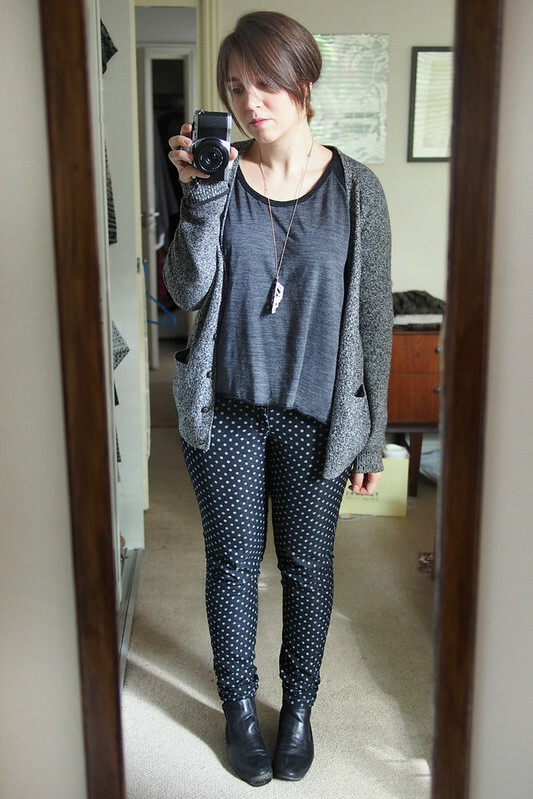 Actually saw some sun today, but it was another 7am start so quite a boring outfit. Comments: Finally the rain has buggered off and it’s got warmer here – though I confess I chickened out and put on some tights on those pasty legs after taking this photo just in case in turned again. I was at work, and in the evening went for a fancy dinner with Josh – good comfy yet smart frock to take me through the day. Comments: Still sunny = bare legs out for real this time. This skirt is just a quarter circle with elastic waistband, made from a Rolls n Rems remnant. 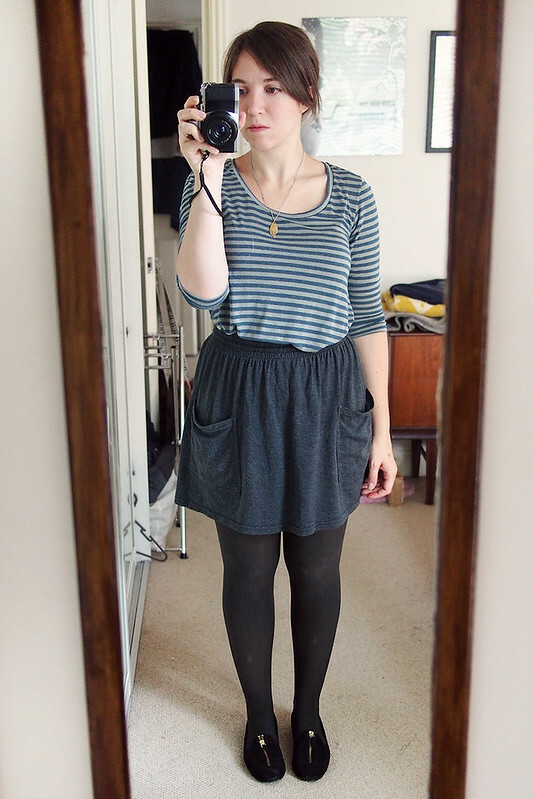 It looks weirdly similar to a skirt Andrea made recently! Quick and cheap win, must make more of them. Comments: This dress was a recent practice at rubibing-off of one of my favourite RTW dresses – it worked so well I’m more than happy wearing the test. I’ll blog about the drafting process if anyone’s interested. On this bank holiday Monday I did some work at home then went to meet my sister for a late lunch in the sun. 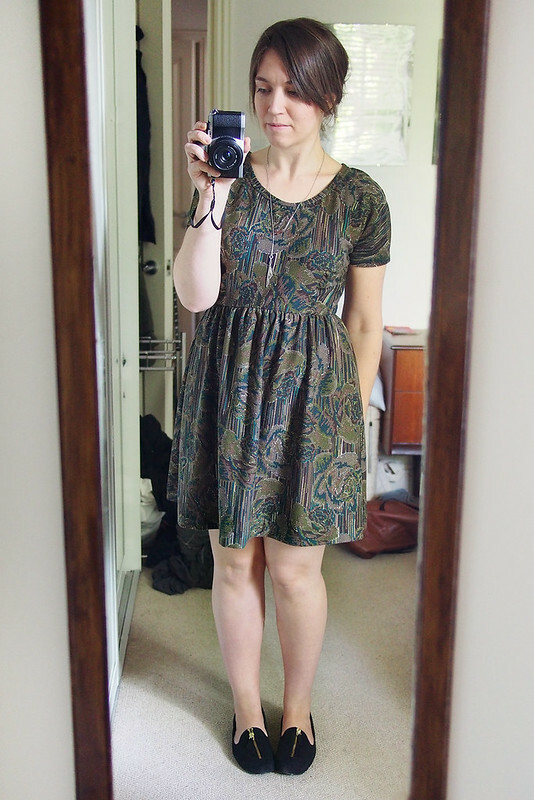 Apart from the rather short and billowy frock getting embarrassingly blown about in the breeze, I felt v good in this. Comments: Dug out my first pair of jeans for first day in a new contract job. More comfortable and well-fitting now than when I first made them which is good. Love for my silk Scout still going strong. Comments: Had a 7am start (hence dark photo taken in the evening to avoid waking boyfriend) and would usually cocoon myself in something oversized and black for such an occasion. 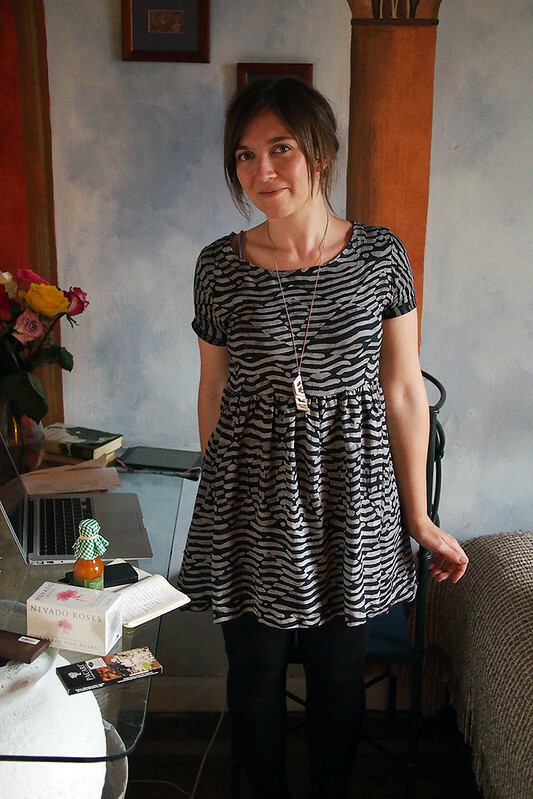 But it was Tilly’s book launch party in the evening, so I just had to wear my LAFS Mimi. Actually I think wearing sunny yellow lifted my mood, and I felt really good in this, even though it’s a little out of my usual style (ie, an actual colour). Better pics & more details on Mimi coming soon. Comments: Ugh, I look scruffy. 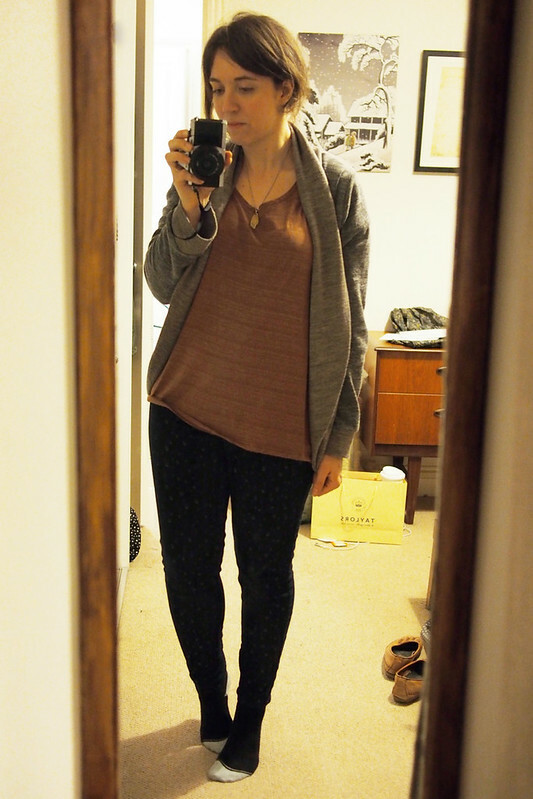 Another long day so a lazy outfit. I was comfortable but felt a bit slobby overall. After work I met Kathryn for an evening of tea-tasting and hologram ballet (yes, really) at Kew Gardens which was lovely, and the wool Julia kept me nice and warm. 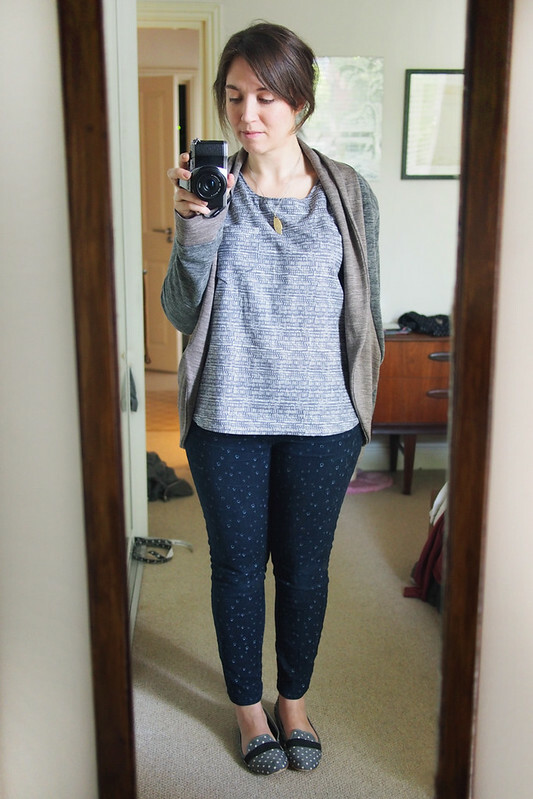 Comments: Tired and wanting this week to be over = lazy grey-zy outfit. The jeans have stretched out a bit which makes them a better fit now! Look at the sole literally hanging off my shoes – this is what happens when I no longer clothes-shop; I wear my RTWs until they actually fall apart. Comments: This is very similar to my Day 1 outfit, just with shinier accents and the pants rolled down. 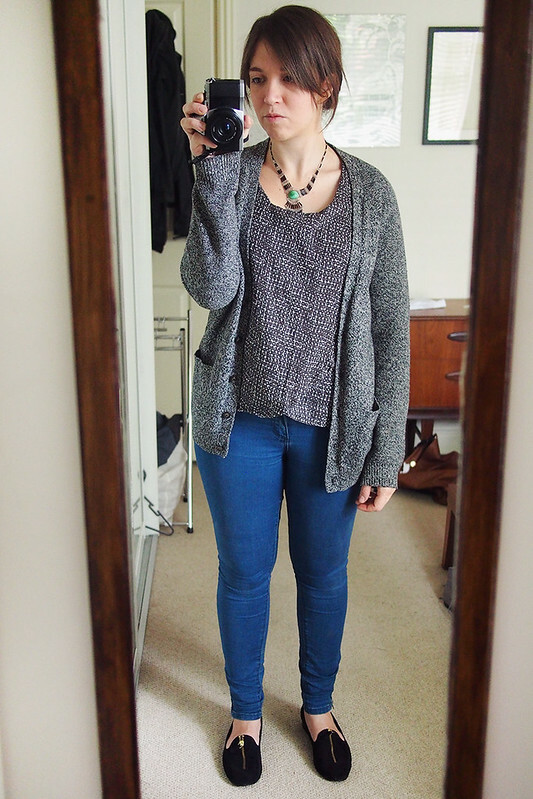 I didn’t actually get dressed until mid-afternoon, after a morning of doing lifeadmin tasks at home. Ventured out in the evening to a chilli festival (yum) – got utterly soaked on the way but luckily the rest of the evening was pleasant. Comments: Another new make on my ‘to photograph’ list. 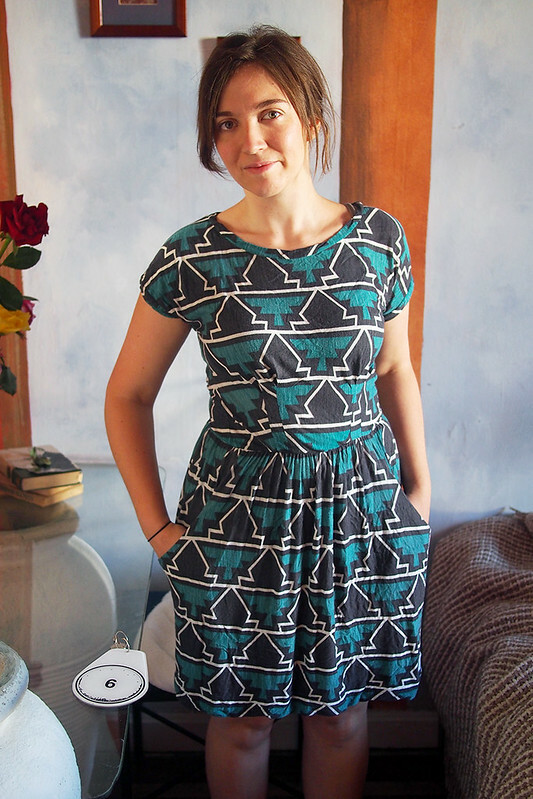 It’s a Zippy Top dress hack using Liberty lawn I bought from Shaukat. Basically in love with it, from the fabric to the fit to the care I took over the construction. 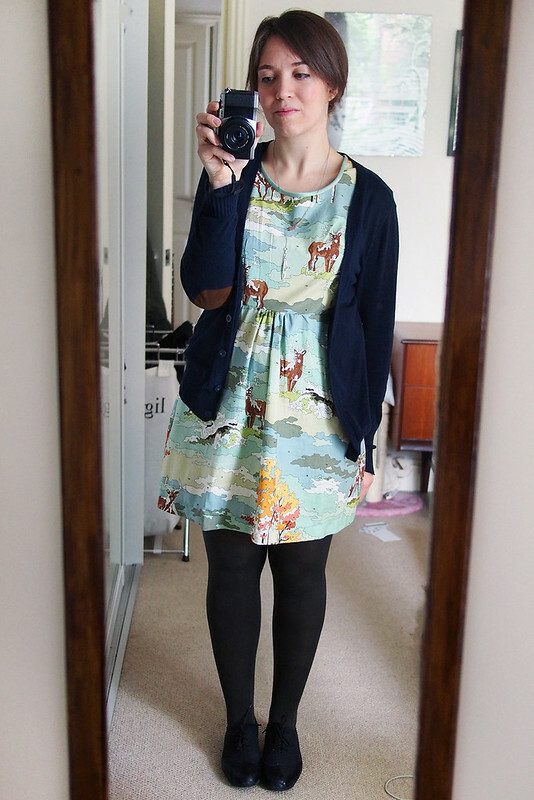 It only could have done with a skirt slip as lawn is a devil for crumpling and sticking to tights, otherwise it’s a winner. I went to meet my family for lunch for my dad’s 65th birthday, which was really nice but another early start and more trains, so I’m pretty knackered now and not relishing jumping into another week of work just yet. Comments: love the colours and silhouette here, but it ended up entirely inappropriate for the non-stop rainy weather. I had an early meeting for a new freelance gig (which I got!) and confess I changed when I got home as I was soaked and cold. 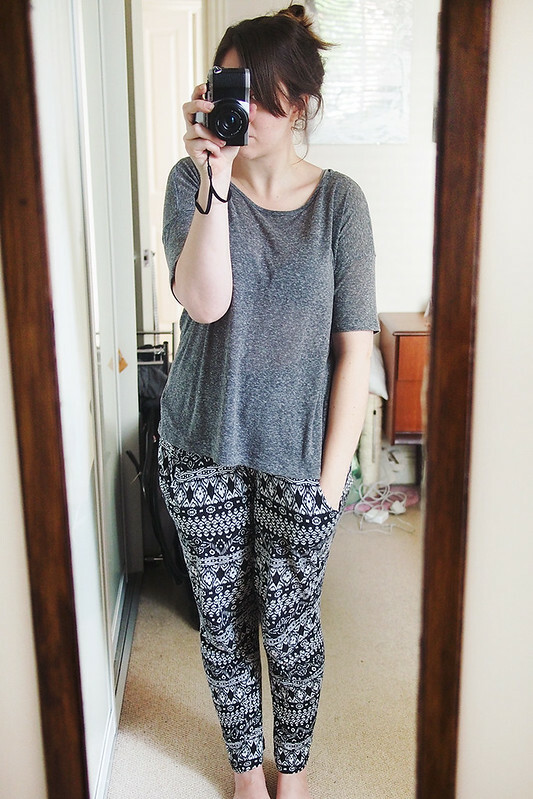 The pants are another successful pair of Burda 7017s which I’ll blog about soon. 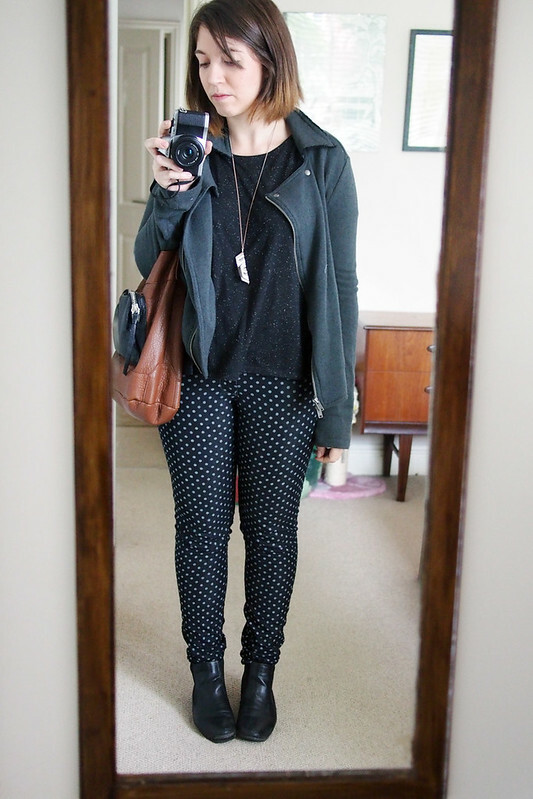 Comments: Felt pretty good and comfortable in this; I went to a meeting and food shopping, then got rained on again. Need to make more tops like this to ease my Primark jersey tee habit. Comments: Pretty much a usual/ideal day outfit for me. I had a bit of a walk and did a hand-lettering class in a nearby art shop. Then came home and sewed :) The top is a See Kate Sew Zippy top, which I’ve basically been making a billion of lately: I have a roundup post with more details coming soon. 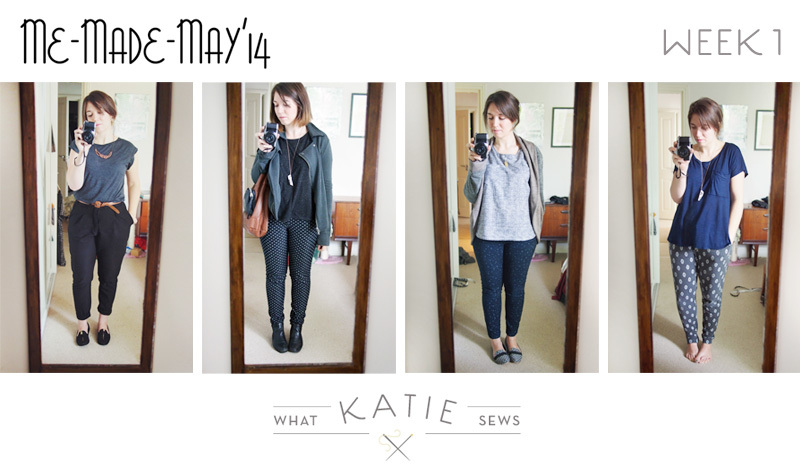 Comments: Home day: sewing, blogging and catching up with work. Might throw on some real trousers and take a walk in a bit. 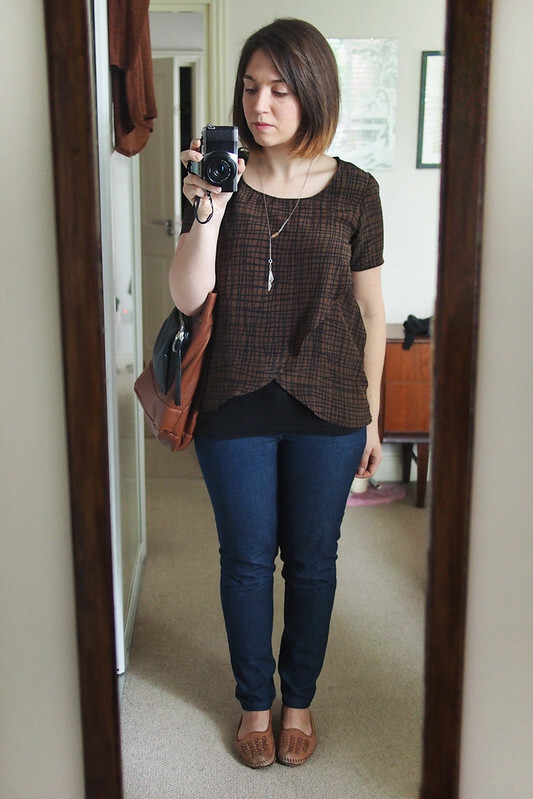 The tee is another Zippy – told you I was into this pattern lately. My sister bought me the pants saying ‘I know you could make these, but thought you’d like them’. I do!